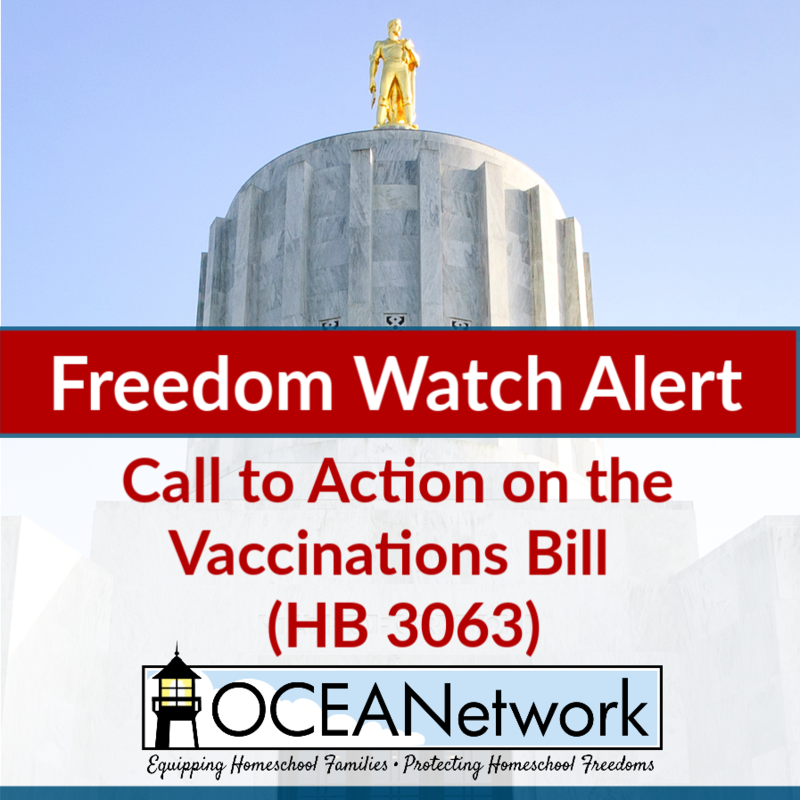 The Oregon House Committee On Health Care voted the Vaccinations Bill, HB 3063, out of committee with a Do Pass recommendation on Thursday. In response, OCEANetwork is going to ask you to do something we haven’t asked you to do before. We are asking you to write a brief handwritten letter to your Representative opposing HB 3063. NOTE: Sign up for emails from OCEANetwork to stay up-to-date on this and other issues impacting the freedoms of homeschooling parents in Oregon. HB 3063 forces all children in public and private schools — and children’s facilities (daycare) — to be vaccinated unless they have a strict medical exemption. It removes the previous philosophical and religious exemptions. HB 3063 does the same to homeschooled students in co-ops which use facilities (such as churches) housing certified children’s facilities. OCEANetwork is neutral on vaccinations because parents should make those choices for their own children. But we oppose the government dictating to parents what happens within their families. HB 3063 is not just about vaccinating students. For all parents, including homeschoolers, it is about the State interfering with their ability to do what is best for their children. This particular bill has two serious defects. It lumps many vaccines together as necessary for school attendance. If only a single vaccination is omitted, the child is excluded from school. So a parent who has a concern about a particular vaccine cannot just keep the child from getting that one vaccine. Then HB 3063 assumes medicine to be an exact science — with no errors — by requiring a “medical” exemption. Doctors can deny an exemption even while knowing that other doctors might approve the exemption. There are many cases nationally where doctors disagree on treatments. Yet HB 3063 strips parents of the ability to protect their children, by eliminating the philosophical and religious exemptions. First, pray that God will protect families here in Oregon. Second, please write a short handwritten letter to your State Representative. It should be two, maybe three paragraphs briefly saying why you oppose HB 3063 — one page at most. Make sure they know you are a constituent. Politely give your own reasons. Use your own words. If you do not feel expert on vaccinations, per se, just write a few sentences about how eliminating the philosophical and religious exemptions prevents parents from protecting their children as only parents can do. There will be others who make more detailed arguments. Handwritten will emphasize how seriously you take this issue. To deliver a consistent message to the legislators, OCEANetwork suggests you write as a concerned parent, which you are. References to homeschooling will only dilute the focus. This is about parents being free to do what is best for their children. You can find your State Representative’s address at https://www.oregonlegislature.gov in the Find Your District and Legislators box at the right side of the page. The bill is scheduled to go next to the Joint Committee On Ways and Means before being sent on to the House floor. It is important for you to start now letting your Representative know your stance on HB 3063. Thank you for joining home educators statewide defending parental freedoms. You can help OCEANetwork protect the rights of Oregon families to do what is best for their children by becoming an OCEANetwork Supporting Family. To stay up-to-date on this and other issues impacting the freedoms of homeschooling parents in Oregon, Sign up for emails from OCEANetwork. If you have questions about this alert / update, please contact us here so that we can funnel questions and concerns appropriately to the Freedom Watch team.